The study area is Medmerry coastline located in south east England. Coastal flooding has long been a problem at Medmerry and a serious risk to the nearby towns of Selsey and Pagham. The previously existing defence, a 3km shingle bank, was subject to regular breach. As well as offering a deficient level of protection, the shingle bank’s maintenance had become costly and unsustainable. An issue in the wider region of The Solent has been the loss of environmentally important coastal habitat, as a result of coastal squeeze. The impacts of development and flood defence infrastructure around the large, urbanised areas of Southampton and Portsmouth have caused local sea levels to rise and wetland and intertidal habitats to be lost to the sea. 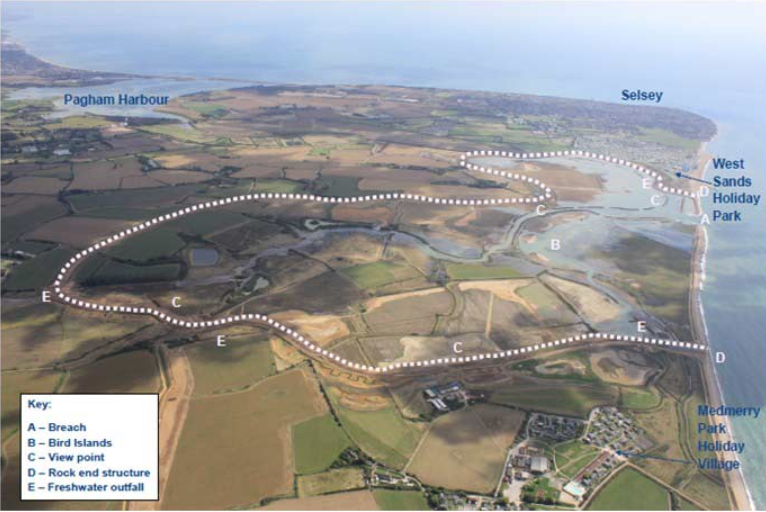 Creation of compensatory intertidal habitat: Delivering 183ha of intertidal habitat, including mudflat, saltmarsh and transitional grassland. Advisory Group (MStAG), a group of self-elected representatives from among the wider group to represent local views, interact with the project team and report back to the community. In 2008, land was purchased for the realignment. Construction began in October 2011 and was completed in late. To assist in decision making on biodiversity issues a Habitat Creation Working Group was created. A further partnership with the RSPB (Royal Society for the Protection of Birds) helped manage construction during breeding times, particularly for rare birds. Important Bronze Age settlements were also discovered in the site and were managed in collaboration with the Centre for Applied Archaeology at the University College London. Sustainable development of coastal regions. Increase awareness of NBS solution & their effectiveness and co benefits. Increase quality and quantity of green and blue infrastructures. Improve connectivity and functionality of green and blue infrastructures. Increase achievements of biodiversity targets. Better protection and restoration of coastal ecosystems. Coastal squeeze remains an issue for other managed realignment schemes, which can be subject to the same erosion processes as natural coastal wetlands. The same methodology of creating water banks can be applied to areas that are in danger by floods. Managed realignment to address intertidal habitat loss or biodiversity still remains debated so it must be studied individually and extensively for every case.